Now, I highly recommend this album for listeners of Aphotic Starfield, Immundus, Fata Morgana, & it sounds much greater then the likes of Ildjarns - "Landscapes" album in a composed sense (even though I like the album Landscapes) but also falls into a catergory of ambient soundtrack music along with Eric Serra, & the Jesper Kyd. This album is another ethereal masterpiece made up of dark brooding intertwining songs that leave the listener lost in a dream like state at first. Deep and mysterious, but also soothing and spacious. The production overall is outstanding and gives you something more then most dark ambient artists just providing you a song made up of one atonal sound track after track. The atmosphere is enormous and was recorded at Perpetual Darkness Studios from October 2010 to January of 2012, mixed & mastered by the same guy who owns the label Quartier 23 in Germany by Priapus 23 of Akoustic Timbre Frekuency. 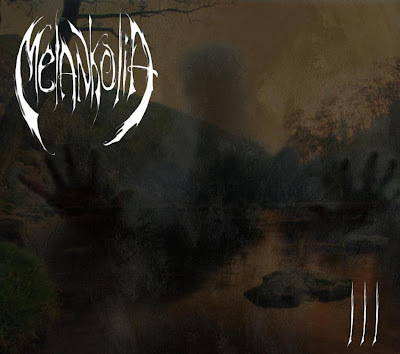 This also the longest, most thorough, well thought out album released by Melankolia since his last album Orpheus Down in 2011 I reviewed here sometime ago. This album also features various artists in other bands, Appalachian Winters D.G. Klyne on the The Darkness Ever Present, Bruno Duarte of Immundus on Beauty...Interrupted, Karsten Harme on Lucidity Through Melancholy, Take Me From This Place with Matt Thyssen of Buer, Loell Duinn on Eastern Sun, Western Darkness, Destiny's March (For All Time)feat Marc of Hoyland and last but not least the infamous Norwegian musician Mortiis on Bring Me Victory on remixing. This sounds like a dream line up for sure! All experienced artists and they certainly bring out the best of each song they are featured on for III. I think this was a very wise idea on Mikes part and also gives you fresh new faces to look up in other styles of music. Of the bleakest and darkest comradery! The III is for one a surround sound experience at home and can either bring out the best or absolute darkest in people. The depths of ones being in this cold & tragic existence... the walk alone out in the damp rainy country side, the moment where you can take the time out to stare at the night sky and wonder, gazing at the stars. Looking out at the moon light. This is that type of album, but also can be depressive to some but uplifting to others. I can say each track has something different to offer and at times it is a overwhelming theme made up of many elements that can put you in a trance along with solitude and silence. Filled with isolation, grief, a numbing feeling.... but gives you goosebumps on your arms. The synthesizers and piano echoing in the distance. The vocals present in songs that feature them are very well done. Melankolias III is a album which offers something new and fresh to listeners of neo-classical/experimental dark ambience while not being too over the top but is like a journey unlike others I have yet to find that is totally similiar amongst dark ambient artists I have experienced in the genre. The music just transcends, and erupts like a theatrical operatic supernova, but its conductor is conducting the sounds of the darkest places of this universe. Only with what he has to his own disposal in instrumentation. If one were offered these instruments and was told to make something beyond a normal piano piece or something greater then one can imagine from a synth or piano sound, this is what would come to fruition. A stellar force of atmosphere and a thunderous wall of magical sounds. “III” is divided into three initial parts related to the formation of the Shadow during an eclipse, namely Penumbra, Umbra and Antumbra, that according to the artist’s own interpretation represent the three parts of the human entity: mind, spirit and soul. The final part, Postscript, represents a calcification in a way, of the internal process that has preceded, as well as a substantiation of its results. The completed formation of a new personality or a new Self. The three phases of an eclipse potentially correspond to many concepts, such as the triple Goddess, the three alchemical phases of the Magnum Opus (Nigredo, Albedo, Rubedo), the IAO formula, the Thelemic signs of NOX, the Jungian symbols of individuation and several other things. The process and inspiration behind the album itself is massive and very astrological. I really like how the artist takes the time to read and understand the celestial and the becoming of ones self. It is really something if you think long and hard about it. Not alot of artists go out of there way to offer such a concept to there albums and it just makes it that just more special. Very interesting concepts here. The songs each have there own body and mind and continue to surprise me one after the other. You can also find marching sounds, romanticism, sadness, classical timeless feels that raise the hair on the back of your neck.